Why does my game crash, freeze, or display a blank screen? Your computer's current graphics configuration may not be compatible with the game. Try downloading the latest video card driver for your system, installing some simple updates, or adjusting your graphics settings. Not playing on a PC? The video card driver tells the computer how to display images on the screen. Manufacturers often release driver updates to keep things running smoothly, so it's important to dowload them when they're available. Select your operating system below and follow the steps to identify which video card you have installed. Then see if any recent driver updates have been released by your computer or video card manufacturer. Type dxdiag into the text box and click OK to open the DirectX diagnostic tool (DxDiag). If you have a 32-bit system, click Save All Information, or if you have a 64-bit system, click Run 64-bit DxDiag. Save the DxDiag report to your desktop. From your desktop, open the DxDiag text file and take note of your System Model, which is shown under the System Information heading at the top of the document. Scroll down to the Display Devices heading to view your video card information. Using the information above, locate and download the latest driver for your video card. Open the Start menu (Windows button) in the bottom left of your screen. At the bottom of the Start menu, type dxdiag into the Search box and press the Enter key to open the DirectX Diagnostic Tool (DxDiag). Move your mouse cursor over the lower right corner of the screen. Several icons should show up on the right side of your screen. Click the Search icon to go to the Apps and Search screen. Type dxdiag into the Search. The DxDiag app will show up in the search results. Run the DxDiag app by clicking on it. Select the Search the web and Windows bar next to the Windows start menu. Type dxdiag into the search bar. The DxDiag app will show up in the search results. Select dxdiag. Go to the DirectX End-User Runtime Web Installer page. Run Microsoft DirectX setup to begin installing the latest version. Once complete, try playing your game. Open the Start (Windows) menu in the bottom left of your screen. At the bottom of the Start menu, type dxdiag into the Search box and press the Enter key to open the DirectX Diagnostic Tool. Check your DirectX Version, which is found in the bottom line of the System Information section. If your DirectX version is lower than 11, please follow the next set of steps to update. Go to the Windows Vista Graphics Update page. Click the Continue button and follow the steps listed on the page to (1) create a validation code and (2) enter the code. After Microsoft validates your version of Windows, click the orange Download button to begin the download. Continue on to step four below. If you're using Windows Vista, Windows 7, Windows 8, or Windows 10, please see below for steps to adjust your graphics settings. The Dots Per Inch (DPI) setting affects how images are displayed on your screen. Some games may have trouble displaying if the DPI is set too high or too low. Please check your DPI and adjust if necessary. Click Adjust Font Size (DPI). Click OK and you'll see a prompt to reboot your computer. After restarting the computer, please try playing the game again. If the issue continues, please proceed to the steps below. Open the Start (Windows) menu in the bottom left corner of your screen. Find and open the folder for your game. 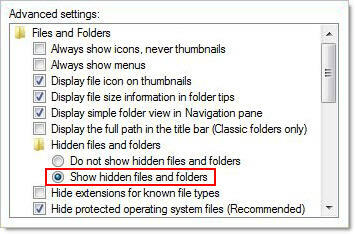 Near the top of the folder window, click Organize and then select Folder and Search Options from the menu. Now the application file for your game should be visible and you can proceed with the following steps to run the game in compatibility mode. Select the Compatibility tab at the top. 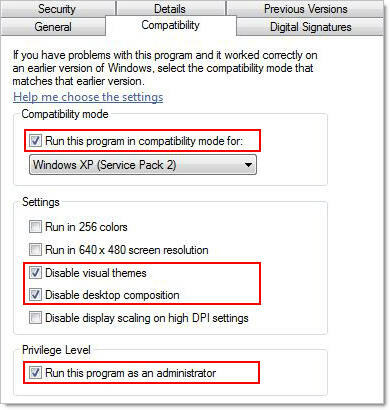 Check the boxes to Disable visual themes and Disable desktop composition. Delete the shortcut icon for your game, which is usually found on the desktop. Afterward, open the Game Manager and then click the Play button to start your game. 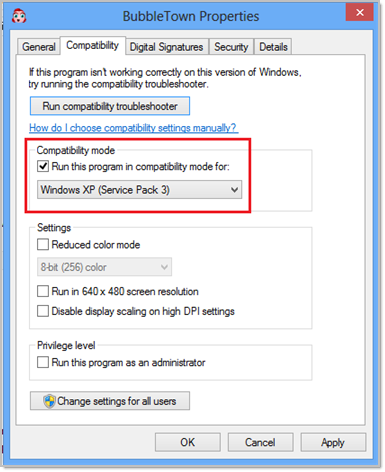 Once a game is selected to run in XP compatibility mode, it can no longer be opened from the shortcut game icon which is usually located on the desktop. Instead, make sure to start your game by first opening the Game Manager, then clicking the Play button next to the game title. The Aero design is the standard appearance setting for Windows Vista. To improve the performance of your game, you can easily disable Aero and use a simpler appearance setting. From your Vista desktop, right-click your mouse and choose Personalize. Select the Window Color and Appearance link. Next, click on the Open classic appearance properties for more color options link. From the Appearance Settings window, select Windows Vista Basic as the color scheme and click Apply then OK. When finished, try playing your game. Click Smaller - 100% (default) for the text size. 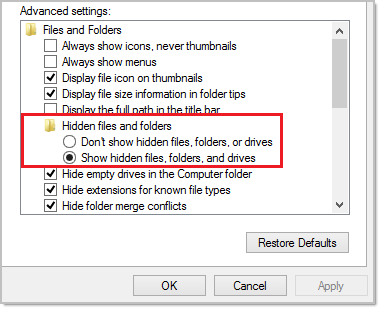 Near the top of the folder, click Organize and then select Folder and Search Options from the menu. Check Run this program in compatibility mode for: Windows XP (Service Pack 2 or 3). The Aero design is the standard appearance setting for Windows 7, and it uses more graphics resources than simpler designs. To improve the performance of your game, you can easily disable Aero and use a simpler appearance setting. From your Windows 7 desktop, right-click your mouse and select Personalize. Press the Home (Windows symbol) and x buttons on your keyboard, or hover over the bottom left corner of the screen and Right-click. The Aero design theme is the standard appearance setting for Windows 8, and it uses more graphics resources than simpler designs. To improve the performance of your game, you can easily disable Aero and use a simpler appearance setting. From your Windows 8 desktop, right-click your mouse and select Personalize. Locate the folder designated by your game’s title. In the game’s folder, select View at the top, and then check the box for Hidden Items. After following the steps above to show hidden files, you should see a faded or greyed out icon for the game. Right-Click on the game’s icon and select Properties. Trouble viewing or playing a game can sometimes be resolved by a simple reinstall. Follow the steps below to uninstall and reinstall your game. Click the trash can icon next to your game. Click Install Now next to the game. If you have not yet purchased the game, find the PC game or find the Mac game and reinstall the trial version (when available) to play any remaining minutes. For more information, please see the Reinstall a Purchased Game help article.